^ "Post Office Location - LAREDO." United States Postal Service. Retrieved on May 5, 2009. ^ University of Texas Health Science Center Laredo Campus Home Page Archived 2014年3月14日, at the Wayback Machine. ^ Laredo Morning Times "National report lists Laredo as largest inland port" Archived 2006年5月14日, at the Wayback Machine. 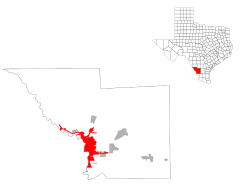 ^ Shopping Demographics in the Laredo Area Archived 2007年9月28日, at the Wayback Machine. ^ Laredo Labor Market, South Texas Workforce Commission Archived 2008年6月28日, at the Wayback Machine. ^ Parks & Recreation Department Archived 2008年5月2日, at the Wayback Machine. ^ Laredo Morning Times; Monument to medal holders unveiled early Archived 2011年7月26日, at the Wayback Machine. ^ Laredo Public Library Bruni Branch Archived 2007年8月4日, at the Wayback Machine. 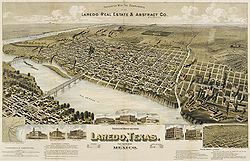 ^ Emporis; Laredo Buildings Archived 2007年9月29日, at the Wayback Machine. ^ Providence Surgical & Medical Center Archived 2012年2月6日, at the Wayback Machine. ^ Gateway Community Health Center Archived 2015年6月17日, at the Wayback Machine. ^ Laredo Morning Times article; Laredoans of the Year; LMT names sports leaders Shashi and Priya Vaswani (renovation of the TAMIU Soccer Complex) Archived 2011年11月2日, at the Wayback Machine. ^ Laredo Civic Center Archived 2007年8月8日, at the Wayback Machine. ^ visitlaredo.com Laredo International Sister Cities Festival Archived 2008年6月3日, at the Wayback Machine.